A special guest post by Michael Akinlaby to help nonprofits, NGOs and Social Enterprises utilize the power of content marketing to win supporters and donors online. Many organizations are not using the web enough to promote their nonprofits. The web has created lots of opportunities in various industries in the last decades. It’s sad to say that the nonprofit industry hasn’t benefited so much from the adoption of the web. The charity sector lacks enough marketers who specialize in nonprofit marketing. If you’re planning to volunteer to help or work for a nonprofit organization as a digital marketer, this article will help you get started. Nonprofits are still way behind when it comes to implementing content marketing as a way of getting the attention of potential supporters and donors. Most charity organizations rely heavily on print than the internet. We’ve been witnessing the slow death of print over the past few years. Just last year, we saw The Independent became the first national newspaper to close and focus on digital-only publishing. In fact, research showed that some 198 UK local newspapers have closed since 2005. Newspapers are the most commonly used channel for nonprofits. Nonprofits need to rethink how they create awareness for their cause. With content marketing, instead of charities posting their adverts on newspapers, they have to become publishers themselves. They have to own their platforms where people learn about their cause and support them. A nonprofit should set up a website and a blog that drives people from search engines and social media. For example, the National Alliance on Mental Illness Organization has a blog and they update it on a regular basis. Publishing blog posts that educate victims, supporters and donors will help drive awareness for the organization. NAMI created another blog post that originates from a discussion their fans had in their Facebook community. Instead of using a newspaper to get their story out there in the world, NAMI has become its own publisher. Every nonprofit should start a blog where they publish their own stories. Your nonprofit should also build a solid presence on social media to extend its reach. Updates about causes spread very fast on social media because people want to help those in need. They want to be part of something special. Just imagine you can get 100 people to like your message on Facebook, your charity could be exposed to over 30,000 people on the biggest social media site. 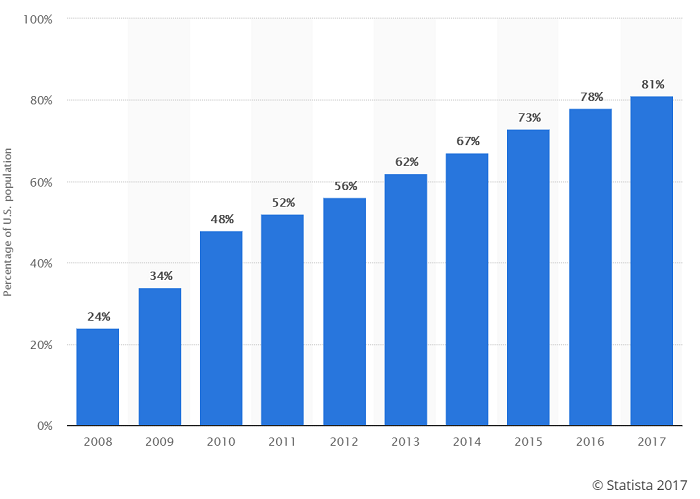 Eighty-one percent of the United States population has a social media profile in 2017, according to Statista. And this is expected to grow in the coming years. 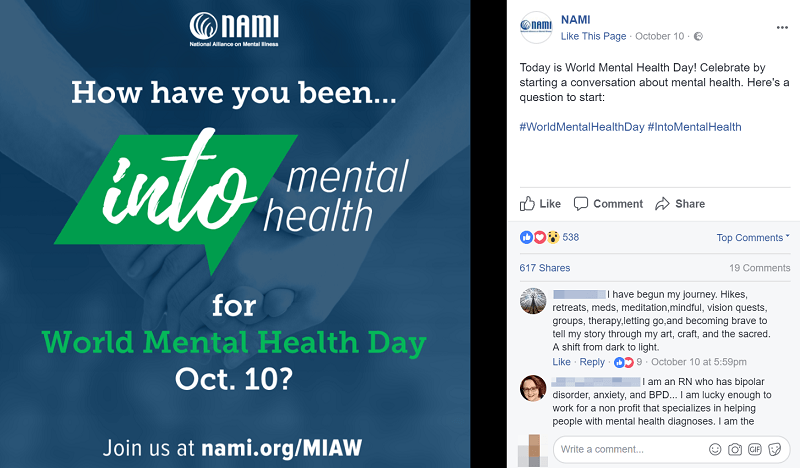 The National Alliance on Mental Illness (NAMI) organization has an active social media page. They use the page to raise donations, awareness for mental illness and relevant event and spark a discussion among their fans. Here’s one of their recent post on their Facebook page raising awareness for the World Mental Health Day. 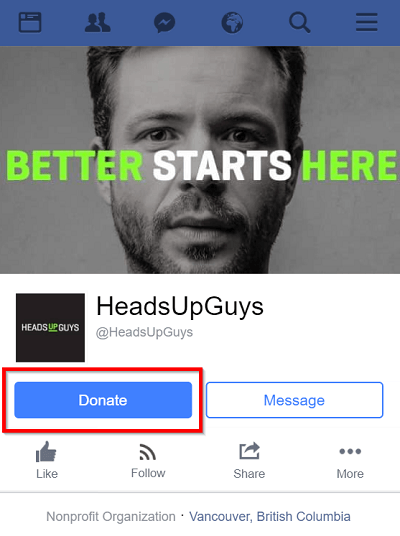 HeadUpGuys is another organization that is using Facebook to build a community for its cause. They have more than 18,000 followers on Facebook. They even ask for donations on their Facebook page. Community building is everything online. If you can get people talking about your organization, they’ll do the marketing for you. A website with a responsive web design is suitable for all screen sizes. A good responsive web design will help visitors navigate your site no matter the kind of device they are using. For example, the Live Strong, an organization that helps cancer patients has a website that adjusts itself to any screen size. Make sure your organization’s website is usable across all types of devices. You’ll help nonprofit organizations excel through digital marketing if you apply the tips reveal in this post. 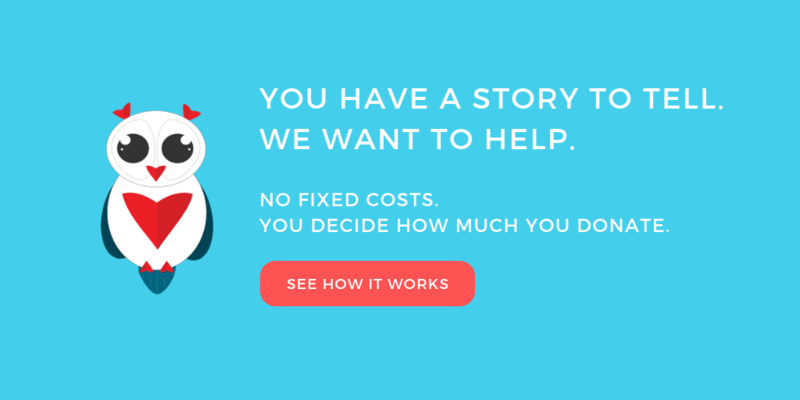 Also, if you own or have a business, you can use it to help nonprofits. For example, Elville and Associates, a special planning and elder law firm in Maryland raise money for charities through their business. You can use your company to make the world a better place. Please let’s help more nonprofits succeed. Michael Akinlaby is an SEO consultant and freelance writer. He writes about digital marketing on RankRain.